Whenever you are in need for premium car rental services, FocusRent is here for you. 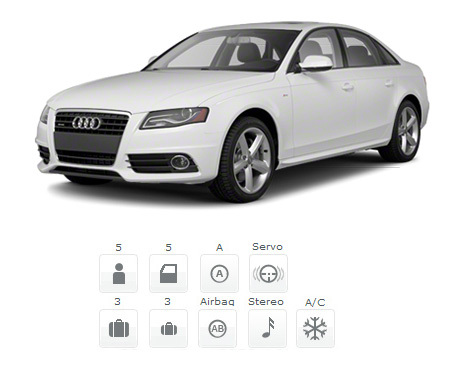 We offer you Audi A4 for rent, which can be yours for only 50 euro/day. With Audi A4, available through our car rental services in Bucharest and Otopeni, you’ll definitely make a great appearance. In addition, we offer a 10% discount for any car available in our rent a car offer, to all of our loyal customers, based on their membership card. Among the features of Audi A4, we mention: Keyless Go, Air conditioning, steering wheel controls, auto-pilot (cruise control), electric windows, leather seats, Bi-xenon, CD Player, Navigation system, Mod S (Sport), electronic trunk (it opens and closes by pressing a button), parking sensors and fog headlights. Whether you wish to leave for vacation, you need to attend a special event or a business meeting, Audi A4 is the most reliable car from our fleet. Also, in case you need a personal driver, we will gladly assist you, starting from 30 euro/day. FocusRent offers you high-quality car rental services, without imposing you a limit of kilometers, with all the taxes and insurances included (RCA and full CASCO), free and fast delivery in Bucharest and Otopeni.